The Orthodox Dioceses of Sitka and Alaska installed David Mahaffey as its 16th Bishop, early this month(2-23-14). A historic and ornate ceremony ensued in Sitka, attracting Orthodox Bishops from New York to Quebec. 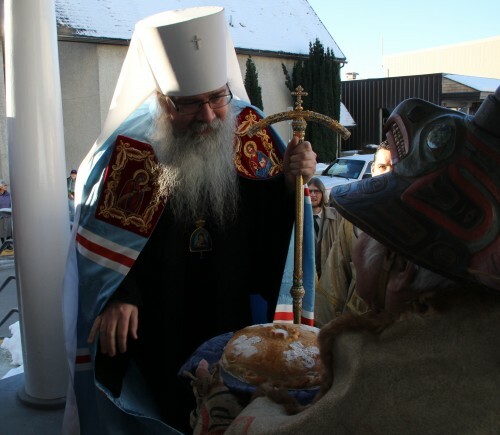 On the steps of St. Michael’s Cathedral, Native elders welcomed Metropolitan Tikhon, the head of the Orthodox Church in America with the traditional bread and salt. David Mahaffey never dreamed of becoming a bishop because he’s always been a family man. On the night before his official installment as the Bishop of Sitka and Alaska, by the yellow light of the Subway sandwiches sign outside of his hotel window, Mahaffey looks over a plaque given to him by the National Parks Service. It lists all of the Orthodox bishops in Alaska ever. From the first one in 1779, during the Russian colonial period. To me in 2014. It’s an enormous privilege that comes with enormous responsibility. Mahaffey is the 16th Bishop of America’s first Orthodox Dioceses. And America’s first Orthodox bishop, St. Innocent, resided in Sitka. Fr. Michael Boyle, the priest and dean of Sitka’s historic St. Michael’s Cathedral says that makes Sitka the motherland of orthodoxy in the United States. Over a century later Mahaffey admits to the same trepidation. Namely, the distance from his grown children and first grandchild who live in Pennsylvania. And on Sunday, he treaded in St. Innocent’s footsteps. 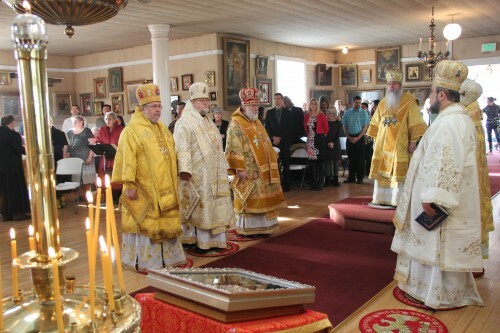 Alongside Orthodox bishops and clergy dressed in golden robes, Mahaffey marched from the Russian Bishop’s house to St. Michael’s Cathedral in Sitka. This procession has been in place since the first Orthodox Bishop was installed. In less than two city blocks it would be official. But, for Mahaffey its the culmination of decades of personal exploration. When Mahaffey’s wife passed away in 2007, a door opened. He could make the move from priest to bishop by accepting a monastic lifestyle. “When I became widowed one of things that happens is you become quote unquote eligible,” says Mahaffey. But he would have preferred to have his wife, rather than an open door. And that’s not an overstatement. Mahaffey was raised Methodist. His wife was Orthodox. After they married, he realized that orthodoxy had something to offer that the Methodist faith lacked. At his first Orthodox service, Mahaffey says he was instantly hooked. Oh man I was like a sponge. This is what I want! That same day, on their way to his mother’s, Mahaffey says his wife expressed that she didn’t want to be seen as having influenced his conversion. So we get to my mothers and I go in and my wife was a hairdresser and my mother wanted her hair done. So my wife got out her stuff. And she knows what I’m going to say so she’s looking at me. She’s behind my mother and she’s going don’t do this! And I said mom, and this is the way I said it and I don’t know why, I said mom I don’t want to hurt your feelings but I want to be Orthodox and I want to become a priest someday. Now I had never said that before! Mahaffey converted, but left his priesthood up to fate. He had a secular job working as a car salesman, but felt unfulfilled. It was his wife who suggested he go to seminary. After his wife died, the Diocese of Sitka and Alaska wanted him for Bishop. He was still reluctant because he didn’t want to leave his kids. But a friend convinced him to at least visit. So, last year in Kodiak, on the anniversary of his wife’s death, during the celebration of St. Herman’s pilgrimage – it finally clicked. Look let me explain it to you, this has gone on kind of… I don’t know if it was St. Herman, or my wife, or God saying listen don’t you get it! You had a beautiful wife who was beautiful inside and out and she really was. So what came to me was a sense of… I’ve replaced your wife’s beauty with the beauty of Alaska. And I replaced her inner beauty with the inner beauty of the people of Alaska. Isn’t that what you want? From that point forward it felt right. Mahaffey was meant to be in Alaska.